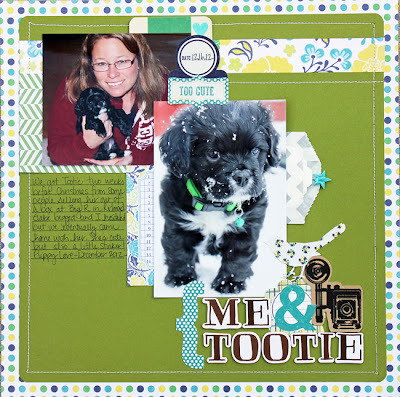 Me and Mine: June Little Red Scrapbook Projects! June Little Red Scrapbook Projects! Hi there, I'm so happy to share my June Little Red Scrapbook kit projects! The June kit features My Mind's Eye- Kate & Co. line, which is gorgeous! The colors are bright and bold with lots of pink, yellow and turquoise. Not my typical colors to scrap with but loved how my projects turned out! 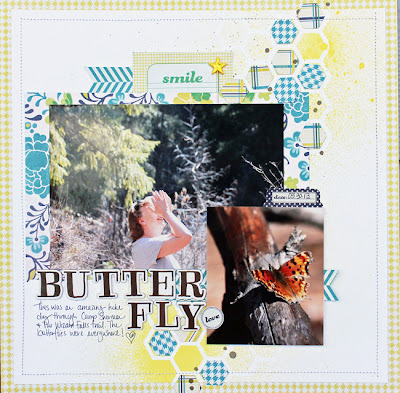 The first layout is of my friend Kathy. Kathy follows my blog so I want to say a quick Hi to her..."Hi Mo! "...Anyway, I took these photos of her and her butterflies on a recent hike we took to the Camp Sherman area. The butterflies were amazing that day. They fluttered all around us and one even landed on my hand. It was truly magical. Gabe is my subject for the next layout. 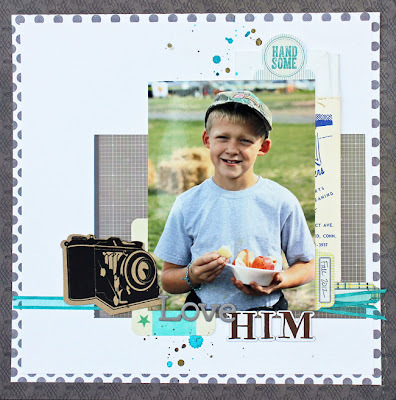 It shows how versatile this kit is because I was able to use mist and the brown papers to create a masculine layout. I also used the package insert from my Studio Calico hexagon stencil as a background for my photo. It matched perfectly! The final layout is of our puppy, Tootie. She is a little stinker and finally almost out of the puppy stage. We love her but it's been a lonnngggg 7 months. LOL. 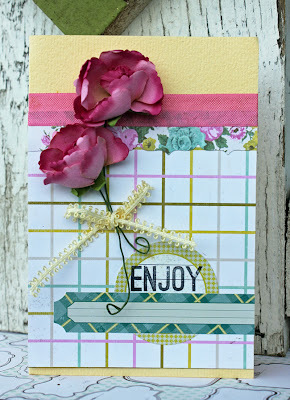 The last project for the month is a card using pink! Yes, I actually created a project with pink...and loved it! Thanks for stopping by and letting me share my latest projects. You can find this wonderful kit in the Little Red Scrapbook Store.